We’re looking forward to celebrating our awareness day, Undiagnosed Children’s Day, with you, on Friday 26 April and would love for you to get involved. There are lots of ways you can get involved whether you want to help share our messages on social media, share your lion images with us, share your story, take part in media work, hold an information stand, fundraise or donate. Find out more below. What makes your undiagnosed child and their sibling/s fierce like a lion? How does your child show courage on a daily basis? What daily things does your child go through or what challenges do they try to overcome? How have you had to show resilience as a family as a result of having a child with an undiagnosed condition? What impact has having an undiagnosed child had on your family and how have you come together as a family? Why does your undiagnosed child and sibling/s give you a sense of pride? How has SWAN UK given you courage in your everyday life e.g. has being a member given you more confidence to push for your child’s needs to be met and for the support you need/ talk to professionals or your friends and family about what it means to have a child with an undiagnosed genetic condition, enabled you to step out of your comfort zone e.g. by doing something you haven’t done before such as going on one of our family events, making new friends, helping to hold an information stand or sharing your story. You can start emailing your quotes and photos now to miriam.ingram@undiagnosed.org.uk. On Undiagnosed Children’s Day we will have hour long Twitter Takeovers led by SWAN UK members from 8am to 11pm. You don’t need to be a Twitter expert to get involved – we will support you. If you’re interested email: miriam.ingram@undiagnosed.org.uk. We’ll also be looking to spread the word during our weekly Twitter Takeovers in April so if you’d like to help let us know. We’ll have an overlay image of a lion so you can change your profile picture and a thunderclap so that you can easily share our message across social media. We’ll also be providing lion masks for you to download so you can share your photos. If you are happy for us to make your photos and quotes into infographics please email them to miriam.ingram@undiagnosed.org.uk or post them on the Facebook post that we put up. We will be posting SWAN UK children’s lion images with quotes from children, young adults, siblings and wider/family members about what they have achieved that makes them brave. Please share yours with us: swanchildrenuk. We want to hear from as many people as possible so that we can share your stories on our website and social media and, if you are happy, with the media too. 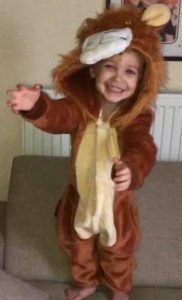 We’d love to hear about your journey and what makes your child brave like a lion, as well as how having an undiagnosed genetic condition impacts on the whole family. We can support you with this and send you a Q&A if you would like. Let us know your name, where you’re from and what media you’d be happy to do e.g. local or national press and print, radio or TV. We can then get in touch with you if we have any opportunities. We’d also encourage you to approach your local press with your story and information about Undiagnosed Children’s Day. Contact us and we can support you to get in touch. Help us spread the word about SWAN UK by holding a stand in your area such as at your local hospital this Undiagnosed Children’s Day. We can give you all the resources you need. We can kit you out if you’re hosting a fundraiser for SWAN UK – claim your free t-shirt today. Set up a JustGiving page for your fundraiser. This is an easy way to share your challenge with your family, friends and colleagues and collect donations all in one place. 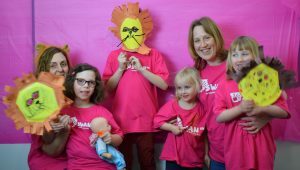 Help us make the loudest roar to raise awareness of undiagnosed genetic conditions and enable SWAN UK to continue supporting these courageous families. If you have any questions about fundraising for SWAN UK this Undiagnosed Children’s Day email: fundraising@undiagnosed.org.uk. Email us to share your lion photos and quotes and find out more about getting involved: info@undiagnosed.org.uk.